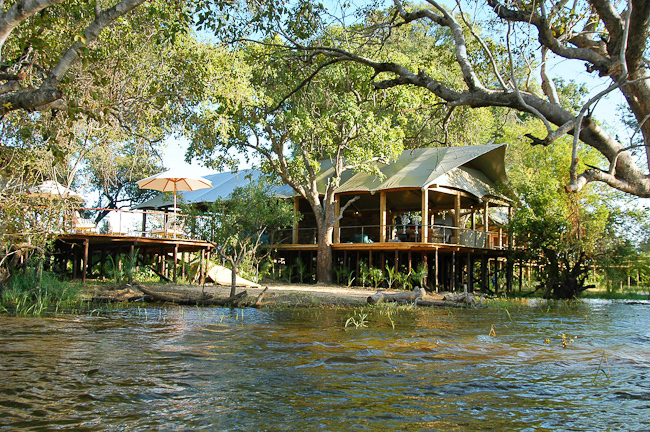 Toka Leya Camp is situated on the banks of the Zambezi River in the western sector of the Mosi-Oa-Tunya National Park, some 12km up stream from the Victoria Falls, one of the Seven Natural Wonders of the World. The camp overlooks the mighty Zambezi River and some of its islands, and is situated under a shady canopy of jackalberry and waterberry trees. The islands in front of camp are intriguing and part of the braided channel of the Zambezi with some rapids, a main channel and fringing dense vegetation. The camp consists of 12 spacious en-suite safari-style tents. Wooden walkways snake between the units and main area, limiting our footprint on this pristine area. Tent interiors boast cool wooden flooring, tasteful, uncluttered African décor in earthy hues, climate-control for a cool summer sanctuary, expansive wooden deck from which to soak up the views of the Zambezi River, often to the sights and sounds of birds, elephant and grunting pods of hippo.The islands in front of camp are intriguing and form part of the braided channel of the zambezi River with several rapids, a main channel and dense vegetation. The eastern side and main area of camp is under a shady canopy of jackalberry, knobthorn and waterberry trees. The western side is in a more open setting - an ancient baobab tree is the focal point and panoramic Zambezi vistas. Family units are positioned to offer quiet seclusion. At 1,708 metres wide, Victoria Falls is the most expansive curtain of water in the world and drops more than 100 metres into the sheer Zambezi Gorge. Located in the south-west corner of Zambia, these Falls and the Zambezi River are the central points in an area of spectacular scenic beauty: from the Falls themselves to the broad, picturesque course of the Zambezi River upstream, the rainforest adjacent and the stark jagged gorge downstream, the power and timelessness of nature's forces are evident throughout. The Tonga and Makalolo peoples lived here for centuries before the Falls were 'discovered' by David Livingstone in 1855. He gave it the highest honour he could think of: naming it after his Queen. Its local name, Mosi-Oa-Tunya - "the Smoke that Thunders" - more accurately defines the essence of the place: the rising, shining spray that can be seen 30km away. This vapour has the effect of adding moisture in the form of humidity to the air in the "splash zone", so that a unique, small rainforest ecosystem clings to the edge of the Falls, providing a toehold for no less than 70 shrub and 150 herbaceous species, as well as trees such as pod and Natal mahogany, ebony, Cape and strangler fig and Transvaal red milkwood. Further away from the constant spray, the surrounding area comprises mopane and teak woodlands with luxuriant riverine forest along the banks of the Zambezi River. The presence of several protected areas in the vicinity, from the Zambezi National Park in Zimbabwe to the Mosi-oa-Tunya Zoological Park in Zambia, means that herds of big game such as elephant and buffalo, as well as smaller species and even predators such as lion persist in the area. As mesmerising as the Falls are, the paths through the rainforest at their edge allow one to catch a glimpse of some of the mammals that live here: bushbuck stare shyly from behind a bush, banded mongoose scurry through the undergrowth, and vervet monkey and baboon flit through the trees; wailing Trumpeter Hornbills sail past in their characteristically undulating flight and the crimson-blazoned wings of the Schalow's Turaco can be seen by patient birders. Interestingly, there is a distinct difference in the fish species above and below the Falls, which clearly form a comprehensive barrier to fish movements upstream: 39 species are recorded from below and 84 above the Falls. Nile crocodile and hippo are common above the Falls. Vic Falls, as it is affectionately known, straddles the border between Zimbabwe and Zambia, and both countries share its World Heritage Site status. As Wilderness Safaris has expanded its presence in Zambia, more opportunities have arisen to partner with the local people in caring for and learning about our environment. Employment opportunities have been the first step in this process; initially in construction casual labourers from remote surrounding villages are employed to help build the new camps, and then later in the open camps where local men and women are permanently employed in ecotourism positions. With permanent employment comes training and skills development. Rural income is such that those employed in a 5-month construction period earn more than 8 times the annual average income for rural Zambians. Wilderness Safaris' Zambia camps, including Tokay Leya Camp, have pioneered the use of innovative energy-saving systems, which are being used as a model to lower the environmental footprint across the entire portfolio of Wilderness Safaris camps in all regions.